A latest site addition to my list of social/online community of websites is a Free Blog Hosting site powered by WordPress. You can now create your own Free blog by signing up at http://bloggista.com/. 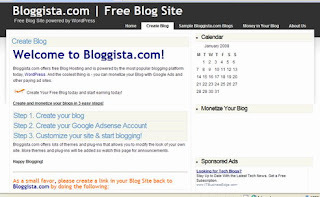 Bloggista.com offers free Blog Hosting and is powered by the most popular blogging platform today, WordPress. And the coolest thing is – you can monetize your Blog with Google Ads and other paying ad sites. Create Your Free Blog today and start earning today! With its BLOG IMPORT feature, you can import easily your existing blog in Blogger.com (Blogspot), WordPress.com or in most blogging platforms. Create and monetize your blogs in 3 easy steps! Step 3. Customize your site & start blogging! Bloggista.com offers lots of themes and plug-ins that allows you to modify the look of your own site. More will be added regularly as soon as new themes and plug-ins are available at WordPress.org.